New York University Press, 9780814758182, 337pp. 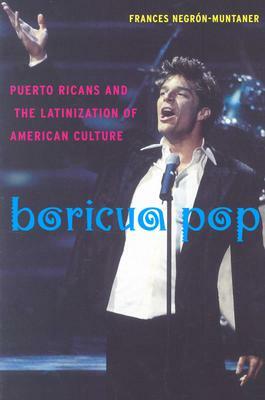 Boricua Pop is the first book solely devoted to Puerto Rican visibility, cultural impact, and identity formation in the U.S. and at home. Frances Negr n-Muntaner explores everything from the beloved American musical West Side Story to the phenomenon of singer/actress/ fashion designer Jennifer Lopez, from the faux historical chronicle Seva to the creation of Puerto Rican Barbie, from novelist Rosario Ferr to performer Holly Woodlawn, and from painter provocateur Andy Warhol to the seemingly overnight success story of Ricky Martin. Negr n-Muntaner traces some of the many possible itineraries of exchange between American and Puerto Rican cultures, including the commodification of Puerto Rican cultural practices such as voguing, graffiti, and the Latinization of pop music. Drawing from literature, film, painting, and popular culture, and including both the normative and the odd, the canonized authors and the misfits, the island and its diaspora, Boricua Pop is a fascinating blend of low life and high culture: a highly original, challenging, and lucid new work by one of our most talented cultural critics. Frances Negron-Muntaner is an award-winning filmmaker, writer, journalist, and cultural critic. She is the co-editor of Puerto Rican Jam and author of Anatomy of a Smile. She currently teaches at Columbia University and lives in New York City.